YOU TAG OR WE TAG...YOU CHOOSE! Save time and sell everything in one spot over one weekend! Our consignors average $300 in sales! 1. You Tag: Consignors earn 60% on sold items, less a $10 consignor fee. Consignors who join our team and volunteer earn an additional 10%-15%, for a total of 70%-75%! 2. We Tag: No time to tag? We can help! See Valet Consignor details below. The online volunteer schedule is OPEN! Be a part of the JBF Community and get rewarded! Earn more on your sales AND shop earliest for the best selection! The more shifts you complete, the more you earn on consigned items AND the earlier you get to shop! The earlier you shop, the better the selection! Drop off and pick up is EASY & FAST! Your items will be inspected AFTER you have dropped them at the sale, so no waiting in long lines. Please bring your consignor waiver to drop off, and your crib and car seat waivers if applicable. When you arrive, bring one item inside to check in. You will then return to your car to gather your remaining items. We have rolling racks and carts for you to borrow. Watch your sales live online during the event! We sort your items, so pick up is QUICK! No need to hunt for your items on the sales floor. Your items will be waiting in one organized pile. You choose whether you'd like to pick up all unsold items or donate some/all of your items to our charity. Please bring your ID to claim your items. You may have someone else pick up your items as long as you notify Julie via email prior to pick up. Items not picked up will be donated to charity. We sell children's clothing Preemie through size 20, as well as Maternity. Be picky. Look at your clothing items as if you were going to purchase them. No stained or damaged items will be accepted, and will be removed from the sales floor during inspection. Please freshly clean your clothing items. Replace missing buttons, sew loose hems and seams, and clip loose threads. Please button all buttons, snap all snaps, zip all zippers before you arrive at Drop Off. This will ensure that there are no defects in the clothing. The newer the item looks (and the better it smells), the better it will sell. Onesie, Socks, Tights, Hats- need to be in a clear Ziploc bag (you may group multiple items in one bag). Please be sure to label your tag well so that customers know exactly what the items are. You can choose to hang your onesies on hangers, or package 4+ into a bag. Please fold and display these within the clear Ziploc bag so it is easy to see and inspect them. Exersaucers, swings, high chairs, changing tables, cribs (Manufactured AFTER June 28, 2011; please bring Crib Waiver for all cribs), strollers, bath seats, baby walkers, car seats & car seat accessories must be checked for safety recalls, must have all parts, and be in good condition. Car seats must have an expiration date of more than one year from the time of the sale, must have the manual (original or printed from the website), and meet the requirements in our car seat waiver that you will leave with us at drop off. Children's furniture - beds (toddler, twin),desks, side tables, dressers, etc. Packaging: If item has multiple pieces use packaging tape, zip ties, or string to keep items attached together. All furniture and equipment must be assembled during the sale. Batteries must be included, if applicable. Books, book sets, board games, puzzles, video games, video game systems, scrapbook, arts & crafts sets are great items for resale. Games and puzzles must have all pieces. Packaging: Keeping tags and multiple items attached is essential for your items to sell. Bag all small parts belonging to toys/equipment in Ziploc bags and tape the bag shut with clear packing tape. Fasten the bag securely to the item with ribbon, tape, or zip ties. Items must include ALL working parts. Packaging: If an item has multiple pieces use packing tape, tagging gun, safety pins or clear Ziploc bags to keep items attached together and clearly visible to shoppers. Batteries must be included, if applicable. Packaging: Fasten shoes together with zip ties. For infant shoes or small shoes without laces, you may put the shoes in a clear Ziploc bag. We prefer no shoe boxes. VALET CONSIGNORS - TOO BUSY TO TAG? We prep your items and you earn 45-50% on sold items! Valet Consigning is limited and will close when spaces are full. 1. Do you have at least 75 items to consign? 2. Are 80% of your items name brand? Less than 20% of your items should be from Target/Walmart. 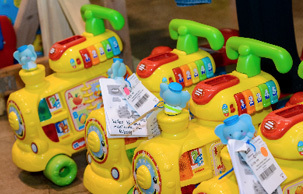 Just Between Friends is currently the only children's and maternity resale franchise that employs a safety and recall expert. That's because we are dedicated to keeping our families safe. We make sure our franchisees and participating families have updated information on safety and recalls that could impact them. Please note that no recalled items may be sold at our event. Our sales are monitored to remove items which the Consumer Product Safety Commission has recalled.